TongaFootball > News > Women's Football > FIFA course keeps women’s game in focus. FIFA course keeps women’s game in focus. Led by FIFA Instructor Nicola Demaine and OFC Just Play coordinator Emmie Sope, the course has given participants a rare opportunity to analyse international matches while honing their coaching skills. Demaine, who joined OFC as the new Women’s Football Development Manager last month, says combining the two events has been hugely beneficial. “It’s great because we’ve been able to incorporate a match analysis section where participants can go out and learn how to watch a game as a coach, looking at the strengths and weaknesses of the opposition,” says Demaine. 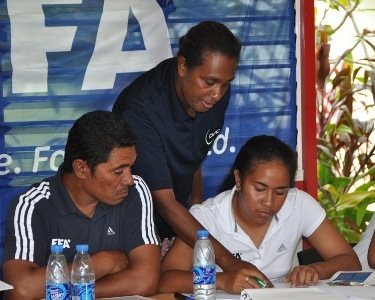 The five-day course, held at the Tonga Football Association (TFA) home of football in ‘Atele, provides an opportunity for coaches to obtain their D License certificate as part of the recently developed OFC coach licensing accreditation scheme. “Those who complete this course will pick up the D License part one and then have the chance to be invited back to achieve part two,” she says. The content is centred around junior and youth level coaching while also touching on elite football with theoretical and practical training. But before any of the coaching sessions get underway, Demaine says there is an important section on planning and organisation. “The first two days were focused on how to create and implement plans to improve the development of women’s football. TFA Technical Director Kilifi Uele believes this planning was particularly useful for the participants. “I’ve been involved in coaching courses before but this is the first time we discussed planning at the start,” says Uele, who is also working during the Women’s Olympic Qualifier as part of the OFC Technical Study Group. 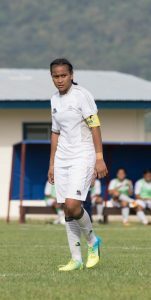 Women’s Football Manager Adelaide Tu’ivailala says TFA has set high targets in the women’s game. 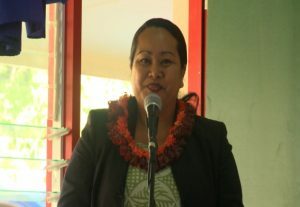 “In our four-year strategic plan, we would like to have a female coach for our national women’s team,” says Tu’ivailala. National team striker Penateti Feke, who is taking part in both the course and the tournament, says she is keen to help grow the women’s game but admits there are still some challenges. “In terms of the culture, not everyone in Tonga thinks that women should be out playing sport so we need to try and change that,” says Feke, who scored a hat-trick on the opening day. OFC will conduct a follow-up course in the next 12 months to assess the progress and see where further improvements can be made. Previous Post FUTURO III concludes in high note.